Ravens, 49ers seek LEED Certification as the NFL attempts to go green. The Super Bowl is hardly an exercise in sustainability. With tons of waste generated and fans descending on New Orleans via plane and automobile, the energy needed for the spectacle to take place is enormous. But that doesn’t stop the NFL from trying. 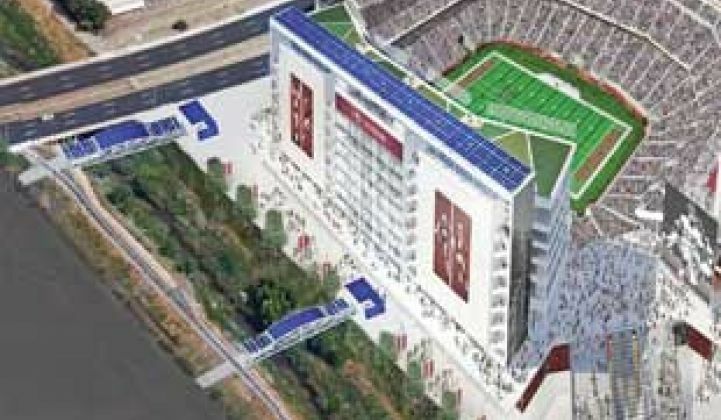 The Super Bowl-bound San Francisco 49ers are attempting to build the first football stadium to open with LEED certification in 2014. As part of obtaining LEED certification, NRG Energy is working with the 49ers organization and the Santa Clara Stadium Authority to be the sustainable energy provider for the new venue. The 49ers are not alone, as the NFL -- and other professional sports organizations -- all have sustainability initiatives on the books. The new 49ers stadium will have three solar installations, including solar array-covered bridges, a solar canopy above the green roof and solar PV on the training center. The total system will have a peak capacity of 400 kilowatts. The amount of energy produced in an entire year by the panels will be equal to the amount of energy used at the stadium during the ten home games of the season, according to Manny Rodriguez, VP of Sponsorships, Events & Charitable Giving for NRG Energy. 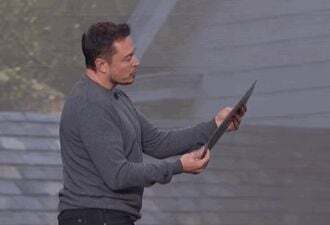 Although NRG is claiming that makes the stadium “net-zero” on game day, the actual energy production from solar arrays will only generate enough power to cover a fraction of the stadium’s use. Rodriguez said on game day an NFL stadium needs anywhere from six to twelve megawatts of energy, with the high end being for a Monday Night Football game with lights. Partnering with America’s most popular sport is no accident for NRG Energy, which is not necessarily a recognizable name to the average American. “We want to showcase our vision around alternative energy,” said Rodriguez. For the new 49ers stadium, NRG was able to work with architects and designers, as opposed to working to just retrofit a facility as it has for its other NFL partnerships. The most visible solar array will be the ones that cover the pedestrian bridges that the majority of fans will have to cross to enter the stadium from the parking lot. For those that might not think to look up, there will be educational messages about solar power and clean energy. The training center’s solar system will be 35 kilowatts, although there is a chance that could grow if the roof on the oldest part of the building is redone in coming years. The third solar installation is on the roof of a rooftop clubhouse that is surrounded by an approximately 20,000 square foot green roof. “NRG is much more than a Founding Partner, they are providing the energy leadership, infrastructure and expertise to help us achieve the vision of making the new Santa Clara Stadium an economically and environmentally sustainable showcase for innovation,” Jed York, CEO of the San Francisco 49ers, said in a statement. The new 49ers Stadium may be the first to achieve LEED certification, but it is hardly the leader among distributed generation within the NFL. The Philadelphia Eagles’ Lincoln Financial Field is certainly out in front with three megawatts of solar, twenty micro-wind turbines and a 7.6-megawatt dual-fuel cogeneration plant. At FedEx Field in Washington, D.C., a two-megawatt solar installation is enough to power the stadium on a non-game day. The 49ers’ Super Bowl rivals, the Baltimore Ravens, are also seeking LEED certification for M&T Bank Stadium. At Super Bowl XLVII in New Orleans, the host committee is offsetting the energy needed to power the game and the travel of the two teams and their support staff. 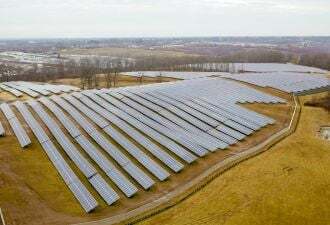 The 4,500 megawatts of power will be offset through carbon credits provided by Entergy. Fans are also invited to offset their carbon from traveling. As for the energy use of fans that gather together at Super Bowl parties for the big game, there’s a little bit of good news. By gathering around one flat-screen TV (rather than everyone staying at home), Opower reports there is actually a decrease in average home electricity use during the game. The same cannot be said for calorie intake.